Yet again my favorite crossover, Okami-styled wolf Link. More or less a redesign from his 2006 and 2008 versions. this is really really amazing looking. I'd like to see what it looks like Not inverted. inverting for this is a cool Idea. 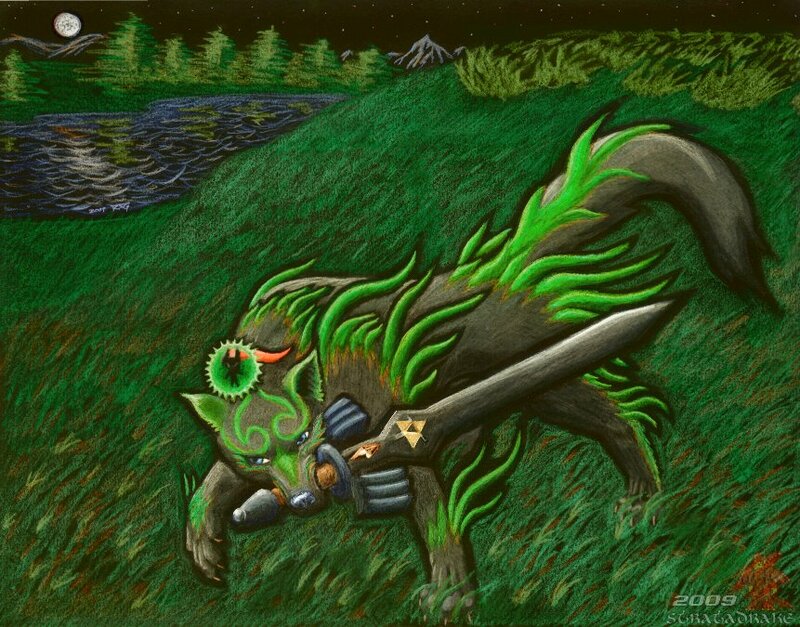 I love your Okami Twilight crossovers they are amazing!!! and the cute Midna/Issun on Link/Ammi's head :D its great!!! O_O I love this ART-STYLE. So bold and....*squints* ;o Did you do this picture on a black piece of paper? Well this reminds me of the way Vincent van Gogh drew The Starry Night. The reflections in the water are nicely done too. I actually drew it on normal paper using an inverted color scheme, and inverted the result after scanning it. So the moon and water reflections are actually black pencil, and the stars are just random dots of Micron pen. Wow! That must've taken some planning! awesome work! So wait. You inverted the whole pic after you scanned it? WHOA! gorgeous work! Your amazing at art! I cant believe this was done in colored pencil.